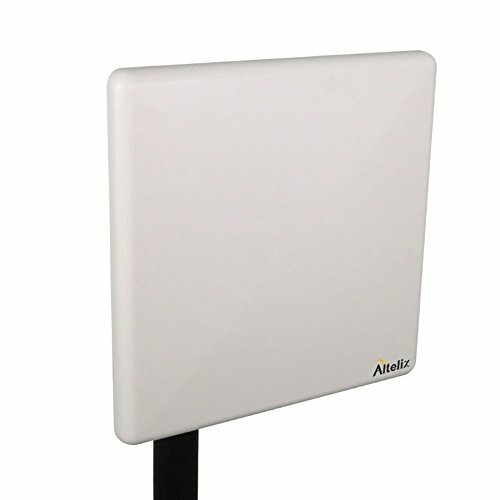 The Altelix AP5158G23 panel antenna offers high gain and quality construction. With its small size and aesthetically pleasing design it can work in any environment. The antenna includes a tilt bracket and U-bolts for mast mounting. This antenna provides full 5GHz band coverage (5150-5850 MHz) making it ideal for use with 5GHz access points and wireless video systems. It is equipped with an integral N-female connector. High Gain 23dBi Directional Panel Antenna for the 5 GHz & 5.8 GHz WiFi Band (5150-5850 MHz). Ideal for 802.11a Wi-Fi Access Points and Routers. Also Suitable for 5 GHz Wireless Video. Install for Vertical or Horizontal Polarization. All Weather Operation for Indoor / Outdoor Use. Light Weight Construction. Integral N Female Connector. Includes Tilt Pole Mounting Kit.